Containers - Either purchased pots or flats or containers you've saved, like egg cartons and yogurt cups. Used pots should be cleaned and disinfected by soaking in 1 part bleach to 10 parts water. Labels/markers - Do this when you plant your seeds, because won't remember what's what. Light Source - If you don't have a bright window, you will need some kind of florescent or high density plant light. There are many good potting mixes available. 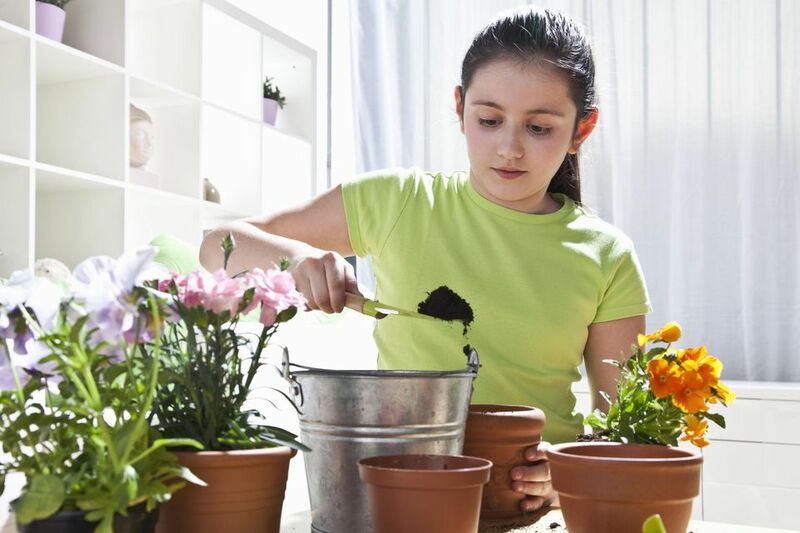 Using a soilless potting mix rather than outdoor soil is preferable because potting mixes don't readily compact, don't contain weed seeds and don't have disease spores and other possible problems. Also, since new seedlings don't require fertilizer until they sprout their first true leaves, you don't really need a mix with fertilizer already in it. Fill about 2/3s full and tap the container on the table top, to help the potting mix settle. Start Planting: Once you have your containers prepared, you can begin planting the seeds. And Water Again:Although the potting mix was pre-dampened, it is still a good idea to sprinkle some additional water on top of the newly planted seed. This insures that the top layer of mix won't dry out and it also helps to firm the potting mix and insure good contact between the seed the mix. First Signs of Growth: Once your seedlings begin poking through the soil, they will start to straighten up and unfurl. What looks like two leaves will appear. These are leaf-like structures, called cotyledons, that are part of the seed and serve as food sources until true leaves are formed, and the plant is capable of photosynthesis. At this point, you should move your seedlings under a light source. Move into the Light: Your seedlings will need between 12-18 hours of light each day. This may seem extreme, but artificial light and even the low rays of the winter sun are not as intense as the full summer sun. The best way to ensure regular, long doses of light is to attach your fluorescent or high-intensity plant lights to an automatic timer. True Leaves: As the seedling grows, the cotyledons will wither and what are called the first "true" leaves will form. This is when your seedling begins actively photosynthesizing. Since it is growing in a soilless mix, you will need to give it some supplemental feeding at this point. Use a balanced fertilizer or one high in nitrogen and potassium, to encourage good roots and healthy growth. Potting up: Seedlings can remain in their original containers until you are ready to plant them in their permanent spots. However, it is common to move the seedlings into a larger pot once several sets of leaves have formed and the seedling is a couple of inches tall. This is called "potting up," and it allows the roots more room to develop. Three to four-inch pots are good sizes to pot up to, allowing plenty of room for root growth. Thinning: If more than one seedling is growing in the same pot, either separate the seedlings into individual pots or cut off all but the strongest seedling. Don't try to pull out the extra seedlings, since this might hurt the roots of the seedling you are keeping. Move the plants to a shady spot for increasing amounts of time, several days in a row. Bring them in or cover them if the temperature looks like it will dip. Gradually increase the amount of time they spend outside and the amount of sunlight they receive until you see that they are growing strong and appear ready to go out on their own. Water your seedlings well before and after transplanting and try not to transplant during the hottest, sunniest part of the day.